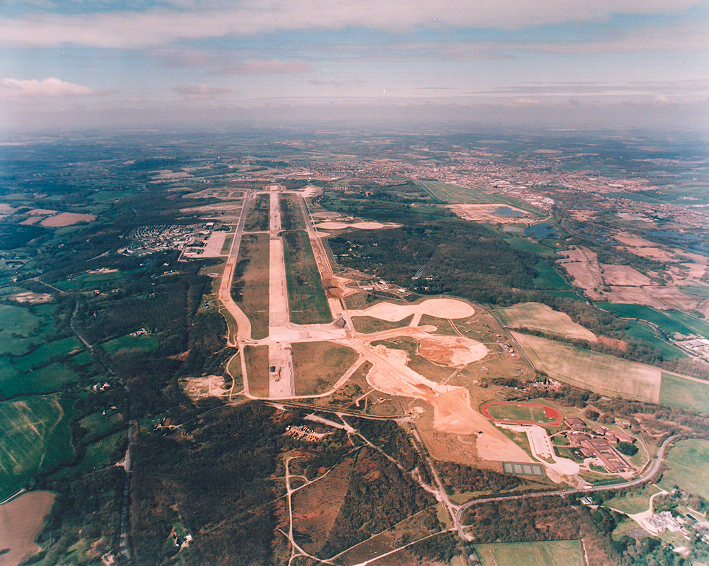 The two commons are often known simply as 'Greenham Common' because of the media prominence of RAF Greenham Common during the cold war. 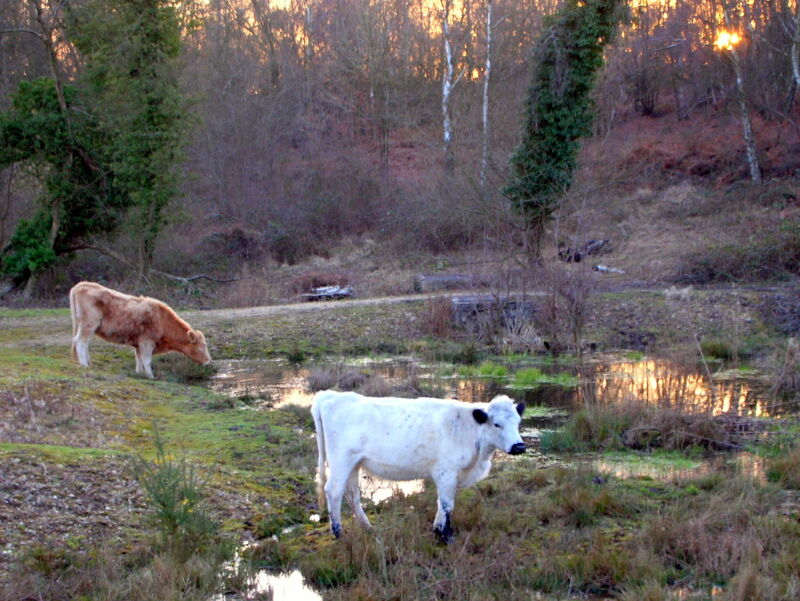 However, a parish boundary runs roughly north-south across the site, historically dividing it into Greenham Common in the west and Crookham Common in the east. This description applies to the two commons together. The boundaries of the commons and of the former airbase are not exactly co-incident. For historical reasons, Crookham Common is access land but the parts of Greenham Common formerly within the airbase are not. However, WBC policy is to treat the entire plan area as access land. The total area is about 500 ha or 5 km2, with a maximum extent of about 5.5 km east‑to‑west. The majority of the common comprises an open central plateau forming a watershed between the Kennet valley to the north and the Enborne to the south. The site is included in the West Berkshire Living Landscape project, a partnership between WBC and BBOWT to extend 'landscape scale' conservation to an area including Thatcham Reedbeds and BBOWT's Bowdown Woods nature reserve. Large parts of the common are also designated as SSSI. The plateau, generally at about 115 to 120 m above sea level, is mainly heathland and acid to neutral grassland, on thin infertile soil over ice-age clay/gravel deposits. Being generally higher than the surrounding land, no surface streams flow onto the common. 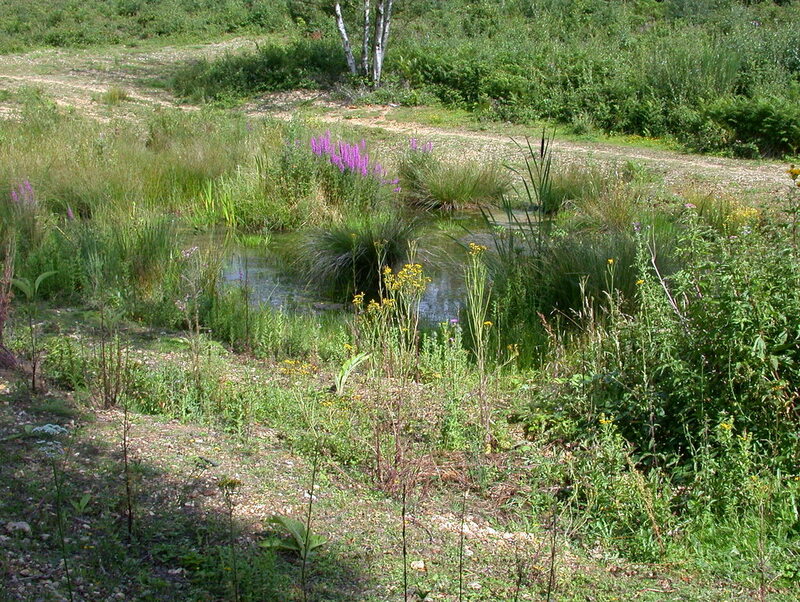 There are permanent and seasonal rain-fed water bodies on perched water tables on the plateau, and springs on the surrounding slopes which drain eventually to the rivers Enborne and Kennet. Some of the ponds are man-made, some having been runoff balancing ponds during airbase days, and others having been excavated during the removal of underground fuel storage tanks. The plateau is surrounded on all sides by slopes and wooded gullies, some of which descend through sandy Bagshot beds to London clay in the lowest valley bottoms at about 80 m. The surrounding woodland includes historic hazel and birch coppice, wet alder woodlands and open mires in the gully bottoms, and some ancient oak wood-pasture. 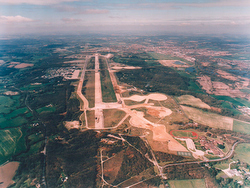 During World War II the plateau was artificially levelled, and some of the gully heads filled in, to form the airfield. One peculiarity of the common is that while the native soils are acid, the imported material is neutral to slightly alkaline, and there were also decades of rainwater runoff from the large areas of alkaline concrete runway. The result is a very unusual mixture of lime-hating and lime-tolerant plant species on the plateau. Since WBC assumed ownership in 1997, the airfield runways, roads and other structures including underground fuel tanks have been removed. Soil contaminated with aviation fuel underwent bioremediation, a process in which it is spread out and periodically turned over to allow bacteria to metabolise the contaminants. Another major project involved the removal of a large volume of imported material from the northeast corner of the common, to re-establish an approximation of the former landforms and to re-create a wetland area. These activities all left large areas of bare gravel subsoils which are gradually re-vegetating, but while they remain sparsely vegetated are very valuable to a number of insect species. Common rights, including those to graze certain animals, collect gravel, and collect firewood, are attached to 65 adjoining and nearby properties and apply over parts of the plan area. 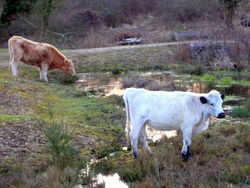 Several commoners graze cattle on the common, with peak numbers reaching about 100 head. 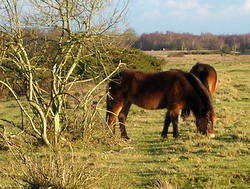 BBOWT also keep a small herd (numbers vary, but typically around ten) of Exmoor ponies on the site. Stock has uncontrolled access to the major area of the central plateau, and to most of the surrounding woods and gullies. Ivermectin veterinary treatments are not used, due to their toxic effects on invertebrates. Public highways skirt the site around much of its perimeter, and in certain areas cut through the common so that small parts of the plan area are separated from the large central area by roads. A post-and-wire stock fence surrounds the grazed area of approximately 380 ha, with pedestrian gates at access points. 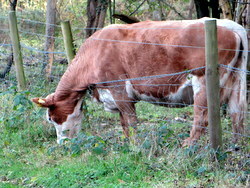 The stock fence is generally as close to the common perimeter as is feasible. 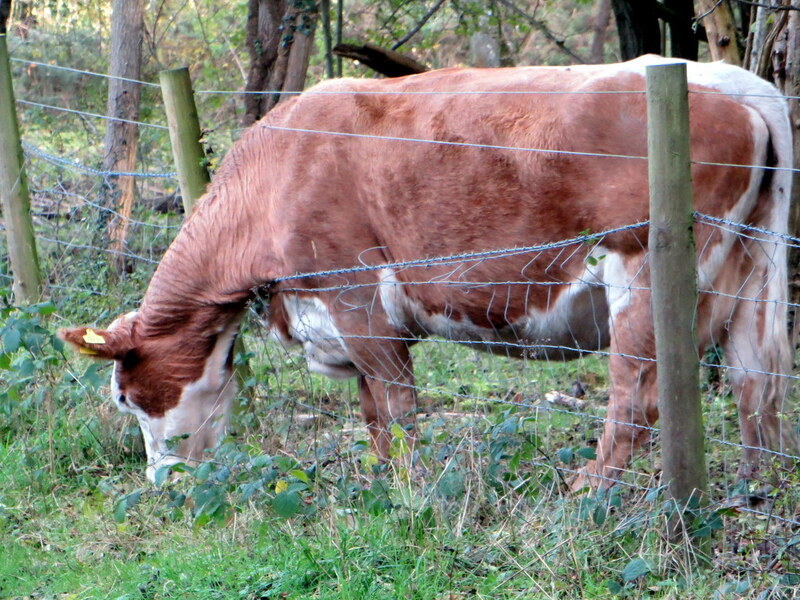 However, some of the areas cut off by the surrounding roads are not accessible for grazing. 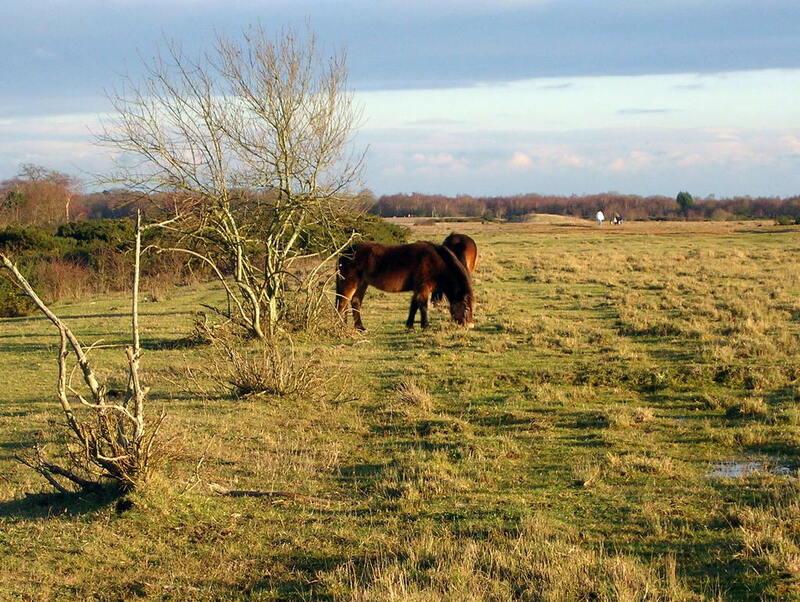 The common is used intensively by local dog walkers, and also by horse riders and cyclists. There is an extensive network of paths and tracks, some signed and others informal. There are three formally designated car parks, and several areas where visitors park informally at the roadside. As with many heathlands, there is a tendency for the open areas to be colonised by scrub and trees. If not managed, the heath would eventually revert to woodland. In the local context this is generally birch succeeeding to oak. Some alien species, actually or potentially invasive, exist on the site. These include sycamore Acer platanus, Turkey oak Quercus cerris, New Zealand pigmyweed Crassula helmsii, Buddleia davidii, Italian alder Alnus cordata and Himalayan balsam Impatiens glandulifera (currently under good control). Rhododendron has also been controlled in recent years, and poses far less a problem than on many heathlands in southern England. For more detail, see the English Nature (now Natural England) SSSI citation and Definitions of Favourable Condition for the SSSI, or individual management compartment descriptions via the compartments index.